I never thought I'd say this, but I cannot wait until everything dies back in the winter. This entire garden has been experimental, to see what grows best where and what needs to come out. Unfortunately, with so little space, I've found that a lot of things are going to need to come out of the outside garden this winter and be moved or given away entirely. Cannas - The yellow cannas are pretty easy to control. They clump nicely and don't cause any trouble, but the red-leaf ones are another story altogether. They don't clump, they spread, and they are getting way out of control, casting shade of things that don't need shade. It has to be moved or taken out. Papaya - I think my papaya is male, because it never blooms. All the blooms just drop off before they even open. Might be the heat, but at any rate, it's not doing what I had hoped, so I don't think I'll be growing papayas next year. I'll probably move it into the courtyard to provide shade and some biomass, but when it dies, it dies. Brugmansias - What a hassle! 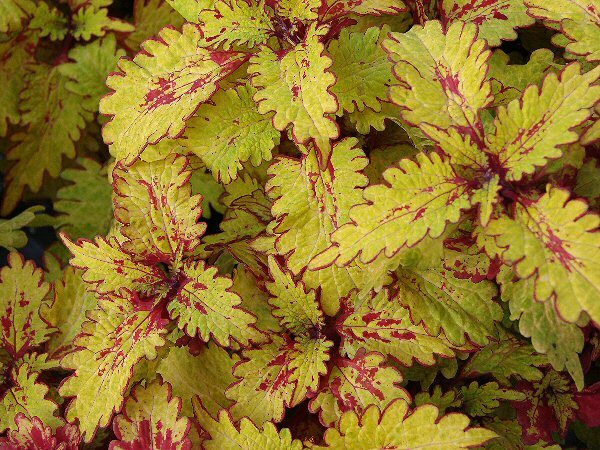 These plants have been a nightmare of acting as candy to every pest on earth! Worms, mites, whiteflies, you name it. They love the brugs! I'm probably going to keep one and give the rest away, then move that one to somewhere else and use that bed for edibles. Just waiting for them all to bloom so I can see if I have anything other than pink. If not, I'll give them all away and buy a Charles Grimaldi, which is the one I actually wanted, and put it into a pot somewhere. Giant native four-o'clock - This thing is HUGE! It gets to be 6 feet tall and that's not what I want. It will either be moved or taken out completely. I don't know if I have any place I can put it where it won't take up too much room and become too invasive. The flowers are pretty, but it's just too big. Lemon grass - has to go. May plant it as a hedge along the back fence, but it takes up too much room in the outside garden. Luna hibiscus - what a disappointment! It did nothing this year and only sent out a few spindly blooms. Maybe it will do better once I take the lemon grass out that is shading it. I'm thinking of moving it to the brug bed this winter. It's obviously very unhappy where it is. Banana - while it's been a good shade plant, it's really too close to the building. One pup came up right against the wall, and it's going to be hard to get out. I'm thinking of moving the whole clump into the corner by the elephant ear to create a nice little shady spot there. I'm going to move quite a few things, actually, and reconfigure the entire outside garden, probably adding a few feet on the far end. Smaller plants are being swallowed up by ground covers and larger plants, so they will be put into their own little space where they don't have to compete. I'd really like to turn the brugmansia bed into an edibles bed. It gets good sun, and the soil isn't bad, with lots of earthworms. So now I'm just chomping at the bit waiting for winter. What are your winter garden plans? ...now looks like this. The banana is over ten feet tall and has two large pups. I planted a pigeon pea next to it which I use for biomass and it seems to be working for nitrogen fixing, don't you think? I discovered that the elephant ear is edible, so I'm letting the little sprouts, which come up everywhere, live and eating their small leaves, also letting them grow to provide shade, which is sorely lacking in the courtyard. I also have basil, ginger and albemoschus manihot growing there, and I've just planted some sweet potato slips to become next year's ground cover. The South wall now has taro, amaranth, butterfly weed, Ceylon spinach, Seminole pumpkin and sweet potato slips planted, but it's also a work in progress which will be my spring project, and too ugly to post pictures of at this point. ...and I was using it for a holding and potting area, but all that is going to go, and I'll start using it for planting. I already have the shampoo ginger growing there, which I will never get rid of since it's grown up under the wall, so I'm just going to keep cutting that back and use it for biomass, since it has no food value and I'm not interested in using it for shampoo. I already have the angled luffa growing in the corner, where all the gravel is, and while it's growing well, I've yet to see any fruit, so that may come down and be used for biomass too. I'll be digging out and amending the soil for planting. I'll dig in as much organic matter as I can find, although I'll be limited by budget and availability until the leaves start falling. I plan to use kitchen scraps as direct compost in the beginning. I'll also be planting a few pigeon peas there for eventual shade, nitrogen fixing and biomass. I'm not sure if that side has earthworms, but if not, I'll move them from the other gardens into this one when I add the fall leaves. I'll string some wire across the top of the wall and tie strings to it for beans to climb. Underneath, I'll plant spinach, collards, onions, and kohlrabi. I thought about seven-top turnips, but I really like collards more. In the very front, I'll plant my lettuces and carrots. Not too sure what to plant as ground cover right now, but I've had some suggestions from the permaculture sub on reddit that I'm looking at. I might use winter squash, even though there probably isn't enough sun there for them to bear, but we'll see. I can also just let beans run across the ground instead of staking them. Eventually, I would like to put a gutter garden on the wall for the lettuce, or tower gardens. Like I said, it's all an experiment right now. So that's the plan so far in this experimental permaculture food forest. I'd be happy to hear your suggestions in the comments. Well, it's been a long time since I wrote in my diary. It's been extremely hot lately, in the mid-to-upper 90s every day for awhile now. I water every morning, and sometimes in the afternoons just to cool the plants and soil off. The outside garden (top) has filled in very nicely, but some things aren't doing as well as others. It's hard to believe that less than one year ago, this was the original outside garden. I remember carefully planting those little slips of plants and mulching them with Spanish moss. the lantana is gone now and that tiny little slip of lemon grass on the far left has gotten so big that I had to tear some of it out this year. Luckily, my next door neighbor took it and is going to grow it in her garden. The Confederate Rose (top far left) was horribly infested with whiteflies, so I had to remove all but the top few leaves to save it. I've been treating the whiteflies that came back daily with a spray of dish soap, oil and cayenne in water and so far, so good. I've also been fertilizing it regularly, and it's started to put out lots of nice, healthy side growth. On the other hand, the bulbs I found discarded in a pile of leaves next to the dumpster turned out to be crocosmia, not gladiolus, and they are blooming beautifully. The double purple datura that I grew from seed is also blooming finally. One put out a bloom in the spring, which is now a nice seed pod for fresh seeds for next year. The coleus are all doing exceptionally well. I especially love the Japanese Giant (left back below) that I got when a neighbor moved out last year. This thing will get about 4-5 feet tall by the time it's done growing. Also in the above picture you'll see that the dwarf yellow poinciana planted out this spring to replace the lantana is doing well. It's grown almost a foot, and I'm counting on blooms in the fall. The sweet potatoes are taking over the garden and the Little Ruby alternanthera (front bottom left) that was one solitary sprig this spring is spreading like crazy. Sadly, the New Zealand spinach is not doing well. I took cuttings hoping to root them, but although I had read reports of how easy they are to root in water, mine just rotted away. I've also read reports that it takes awhile to get started and will surprise me one day by growing like mad, so I just leave it there and hope that report is right, or that it at least reseeds itself for next year. One last picture, then I really do have to go back to work. I bought some markdown plants at Lowe's last year, and while they aren't doing as well as I expected, they are still alive and growing. The Sallyfun Blue salvia is growing very slowly as is the Luna Red hibiscus next to it. The hibiscus bloomed today, which is nice, but the three spindly stems are so weak I had to stake it up so it didn't fall face-down into the ground. I'm going to be moving this in the winter, maybe putting it into a container. That's it for now. I'll report on the inside courtyard permaculture garden soon. Happy Gardening!